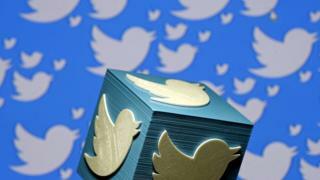 Shares in Twitter have fallen more than 10% after the company reported that its fourth-quarter losses had nearly doubled. The social networking service reported a loss of $167m (£133m) in the final three months of 2016, as against $90m in the same period a year earlier. There were 319 million active users, 4% up on a year earlier, but revenue from ads fell slightly to $638m. Donald Trump’s ardent use of Twitter did little to boost users or ad income. Fourth-quarter revenues were $717m, 1% up on last year’s $710m. Revenues and user numbers both fell short of analysts’ expectations. It was the company’s slowest quarterly revenue growth since it became a publicly listed company in November 2013. Some analysts had expected new US President Donald Trump’s widely publicised use of Twitter would give the service a financial boost. But during a conference call, chief operating officer Anthony Noto dismissed the idea that the “Trump effect” had been a key factor in user growth. He said that while Mr Trump had shown “the power of Twitter” and broadened awareness of the service, it was hard for “an event or a single person” to make such a difference. These were supposed to be the results that showed Twitter resurgent after a year of disappointment. The fact that it had been the prime social networking battleground during the US election and that every tweet from the new president garnered worldwide attention would have new brought new users – and advertisers – flocking in. That was the theory. In fact, the figures showed the slowest growth in quarterly revenue in the company’s short history and a very modest increase in user numbers. The company has put on a brave face, focusing on the growth in daily rather than monthly active users. It also says that revenue growth is lagging user growth – but investors have grown impatient for evidence that Twitter has found a sustainable business model. Donald Trump’s tweets – and the reactions they provoke – may have become essential viewing for journalists and the markets. Whether they make Twitter a great destination for advertisers is a different matter. Despite the increased losses, Twitter chief executive Jack Dorsey said 2016 had been “a transformative year” for the service. “We reset and focused on why people use Twitter: it’s the fastest way to see what’s happening and what everyone’s talking about,” he said. He said daily active usage had risen for the third consecutive quarter and the upward trend was set to continue. “While revenue growth continues to lag audience growth, we are applying the same focused approach that drove audience growth to our revenue product portfolio, focusing on our strengths and the real-time nature of our service.